Homepage - Valente Contracting, Inc.
An Arizona Industry Leader in Concrete Services. Hard working? Driven to succeed? Come work with us! 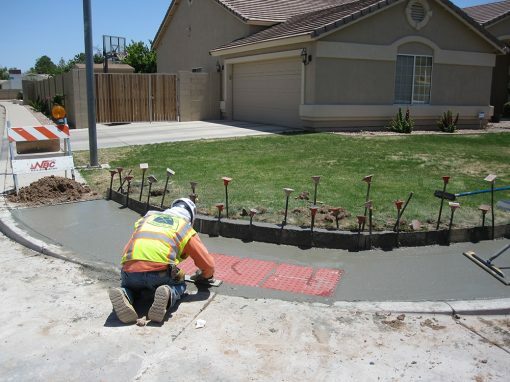 For over 30 years, Michael J. Valente Contracting, Inc. (MJVC) has been serving the state of Arizona with full service, high quality and innovative concrete construction. We work with State and County Agencies, as well as Civil General Contractors, to provide concrete paving, roadway barriers, pedestrian bridges……..
MJVC is always looking for hard-working, qualified individuals to join our team. In addition to competitive pay, we offer many great benefits. We are an Equal Opportunity Employer and hire individuals in a variety of capacities including CDL Drivers, Laborers, Concrete Finishers, Foremen, and Superintendents. Although MJVC self-performs majority of its work scope, we do have a need for subcontractors in various support roles including traffic control, saw cutting, signing and striping, SWPPP, etc. Get your firm pre-qualified today. MJVC is always willing to check out new vendors and suppliers. In lieu of contacting the office, use the Contact Us form with details about your product or service and we will route your information to the appropriate individual. MJVC was awarded a $1.6 million contract for miscellaneous concrete work through Stacy and Witbeck/Sundt, a Joint Venture (SWSJV). SWSJV is the Construction Manager at Risk selected by Valley Metro.